Transform your prayer life with fresh prayer ideas for your friends and family, all drawn from Scripture. We love our friends and family, and we long for God to be working in their lives. But when it comes to praying for them, often we don't quite know what to ask for. Or our requests to God on their behalf feel shallow, repetitive and stuck in a rut. That's where this little book is designed to help. It will equip you to pray powerful prayers for the people you love—prayers that really change things, because they're based on God's word. Each spread takes a passage of Scripture and suggests 5 things to pray for a person in your life. Because when we pray in line with God's priorities as found in his word, our prayers are powerful and effective (James 5 v 16)—and that's a truly thrilling prospect. Use this book in any number of ways: work through it as part of your daily quiet time, or pick it up whenever someone you know is in particular need of prayer. 4.3" x 7" x 0.2"
The Puritan William Gurnall once said: ‘Prayer is nothing but the promise reversed or God’s word turned inside out and formed into an argument and retorted back again upon God by faith.’ It sounds great. But what does it look like in practice? 5 Things to Pray for the People You Love and 5 Things to Pray for Your Church answer that question. They’ll walk you through using God’s word in prayer. And praying God’s word is my number one tip to help people invigorate their prayer life. So read these books and invigorate your prayers. I recommend this series to you on basis of the simple fact that they moved me to pray. They both showed me ways to pray for my church and my loved ones and they kindled in my heart a <em>want<em> to pray. These are simple books, with the modest and eternally profound aim to show how the Bible informs our prayers. Rachel Jones manages the difficult work in withdrawing from the picture and leaving the reader to see how simple it is to align our prayers with the will of our listening Father. These books could well be a cause of great blessing for your church and people you love. "Worth placing in the hands of every church member"
I really liked this book. I liked it’s variety. … Most of all I liked that because all the examples of prayers to pray are taken from God’s Word, using this book leads you to pray for the things that God actually wants to you to pray. The title is slightly misleading as it suggests that there are just 5 things to pray for your church. In fact different bible passages suggest fresh and relevant prayers. i have used it individually and in a group setting. I love all these prayer books and am able to get down to business with God straight away as these books give such brilliant ideas of what to focus on. I have been a committed church member for many years, but was aware that my prayers for my church were rather vague and unfocused. 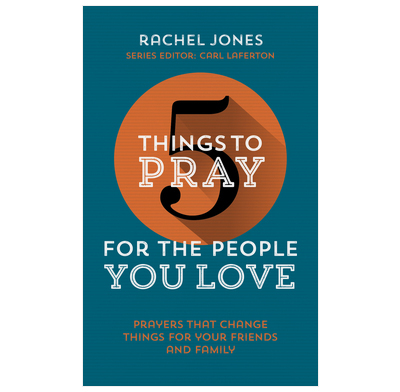 I saw this book advertised, and although my first thought was 'only five things to pray? ', it was very reasonably priced so I bought it. I discovered that in fact there are far more than just five things to pray for! I was impressed that each section was based on a passage of scripture and the 'five things' within each topic related to part of that bible passage. The book has helped me to be much more focused in my prayers, and has pointed me to specific groups or areas within the church, and also in the 'wider church'. I gave a copy to my pastor and to a friend, both of whom found it very helpful, and we have now purchased copies to encourage all of our church to pray. I found the book resourceful with helpful point of prayer, l have recommend it to others. Great little book, full of useful Scriptures to help you focus your prayers for the church, for a variety of situations. Praying God's Word into people's lives. We got a supply for our church and they were very well received. One of our congregation found this little book and we use it every Friday prayer night expecting to pray through it twice each year, absolutely essential tool for all churches. '5 things to pray for your church' is one of the rare breed of books that is so simple and straightforward yet brings about a deep and significant change in your life. As someone in church leadership, I spend large portions of time in prayer for the church (both local and global) that I serve. This book has not only challenged me on how unstructured and poorly founded on the Bible my prayers were, but it has provided me with (and made up for) what was so desperately lacking in my prayers for the church. The book has a succinct and really helpful introduction that sets out the purpose and format of the book. It then has 21 areas/topics for prayer for the church, with 5 things to pray in each of these areas. Each topic is founded on key Bible texts, with each of the subsequent 5 prayer points being drawn explicitly from verses in these Bible texts. Since working my way through the book, I have found that I often think of other related things to pray for and find that my prayer time has begun to naturally expand and deepen as a result. Because of these things, '5 things to pray for your church' is an invaluable tool to help shape and strengthen the prayer ministry of church leaders. It is also an essential resource for church members to help them to be active in prayer for their churches (both leaders and other members), too. Please note, I was given this book free from the Publisher in exchange for an honest review.